If you are keeping up to date with the latest trends you will know that everyone who is anyone is wearing ballerina pumps, Pippa, VB, Kate at home in front of the telly. 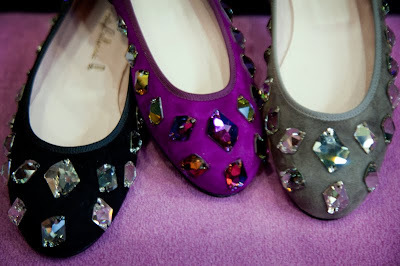 So I thought I'd show you these that I spied yesterday in Pretty Ballerinas while wandering around Soho. I'm a fan of the ballet pumps I must admit Mo, very comfy! !Love the purple pair. Gives new meaning to 'twinkle toes'. Ballerina pumps must be a nice relief from the 6 1/2 inch heals I'm seeing everywhere. These I could wear and if I were there in that shop, I might be tempted to pick up a pair. (PS. A Norwegian designer has since Pippa was photographed with her designer bag, sent her the newest model, and even named it "Pippa". A bit sparkly for me, but definitely better than heels! I gotta get me some of those!! !